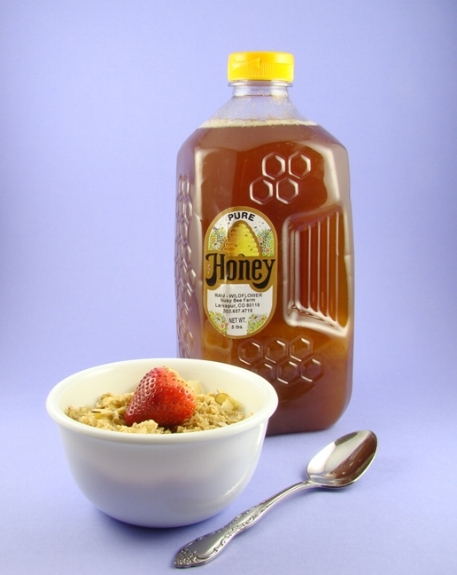 I use Raw Wildflower honey from the hives of Busy Bee Farm in Larkspur, Colorado to make my granola. Raw honey goes from the bee hive to the slinger which separates the honey from the beeswax. Next the honey goes to the container of use. Bees do a great job and need little help from humans! Raw honey never spoils. I’ve cooked with 30-year-old honey. If it solidifies and turns to sugar, spoon it into a pot and melt on the stove, put the honey container into a pot of hot water, or put the honey container in a pot of water set on a stove burner at low heat.